This past week a local grocery store offered ten pound bags of frozen chicken leg quarters for 29 cents per pound. My neighbor and I bought sixty pounds of chicken and this vignette details what I learned. I always forget how much I end up with after processing. That is the reason for today's post. Even though I have a refrigerator now it is not a large one. I prefer having a stash of healthy meats preserved in glass jars. By doing it myself I am certain of the quality of food used. Fats tend to make me sick. I avoid them where possible. Processed meats bought in stores usually have sky-high sodium counts. Goodness knows I don't want that in my diet either. Canning isn't exactly easy. The end product makes the effort more than worthwhile. If you would like to learn how to preserve meats for your ship's lockers, I wrote a pair of articles that will get you started. 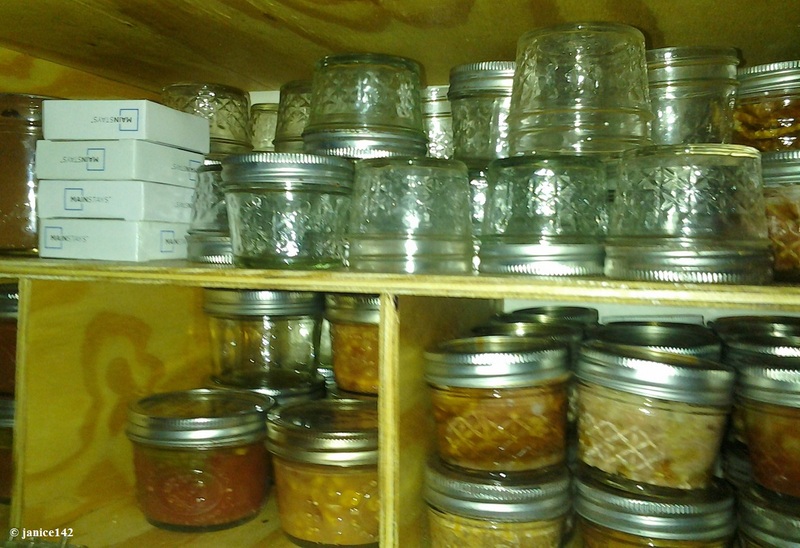 The novice should begin with Canning Primer (Preserving Meats, Part 1). Those with experience may find Processing in Pressure Cooker (Preserving Meats, Part 2) more helpful. Having a stash of yummy pre-cooked meats on hand makes my life easier. When I'm tuckered out there is a simple pleasure in being able to open a jar for dinner. Store-bought canned meats generally are high in sodium. I don't want to add that much salt to my diet. I want to live a long time aboard Seaweed. Eating healthy helps me reach that goal. First, I remove the skin. 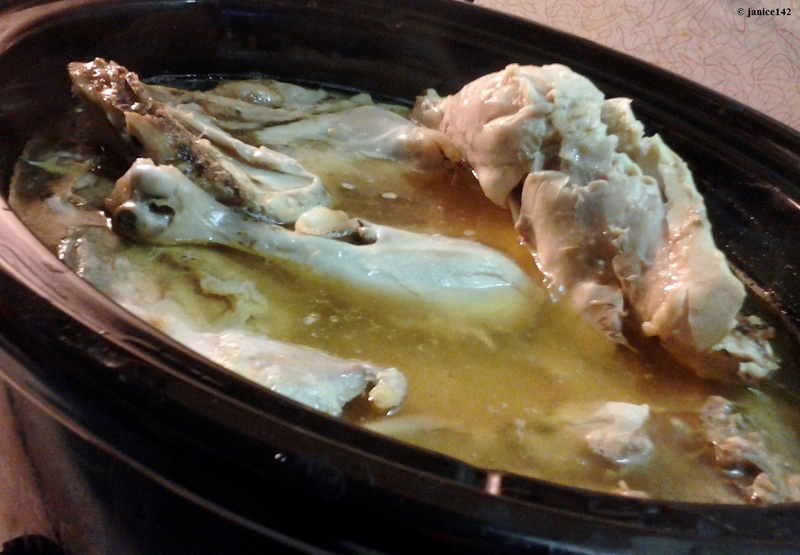 Then I cooked in the crock-pot ten pounds of chicken leg quarters. Once the meat was falling off the bones I removed it from the broth it cooked in. 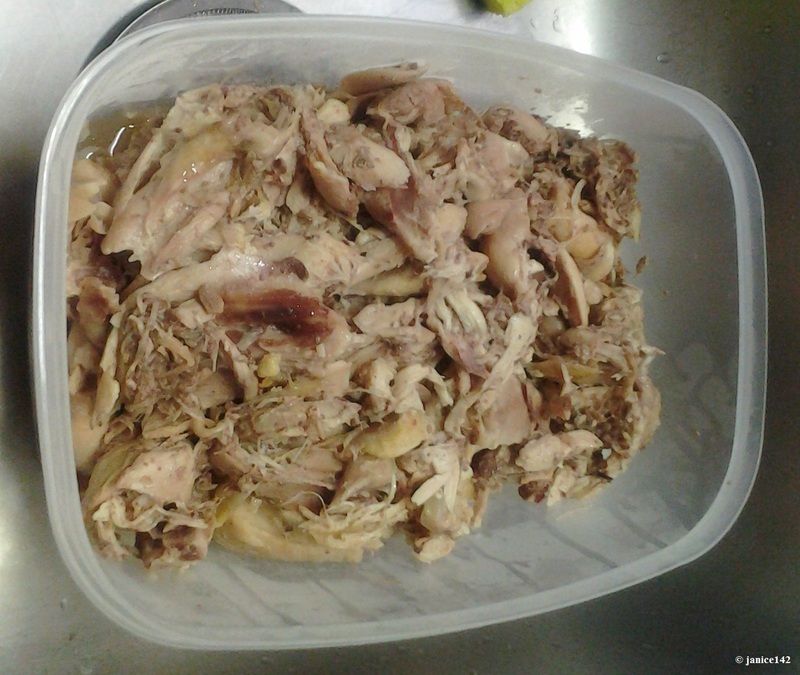 After the chicken had cooled I pulled out the bones and icky parts. Definition of icky parts: the veins and darker bits near the bones, plus the gristle. The ten pounds of chicken leg quarters in the package reduced to four pounds of pure chicken meat. Four pounds of chicken meat fills eight or nine one cup jars or four pint-sized jars. It takes me approximately one and a half hours to make four jars. That includes cleaning chicken, boning, filling jars and cook-time. Processing sixty pounds took the better part of two days. I was using a friend's large crock pot and his pressure cooker. Once cruising I can keep up by doing one batch or two at at time. Were I ever to want to do something similar I'd rent a hotel room with cooking facilities and do it there. In my small galley I would not attempt to do so much at one time. In the past I've done a year's worth of canning in a week while I watch my Grand-puppies in Pensacola. That works too. I'm glad I did it and I am very happy this is done. I still have a couple dozen empty jars and will do more, but not until after the cruise next weekend. I'm glad the chicken is out of the way. 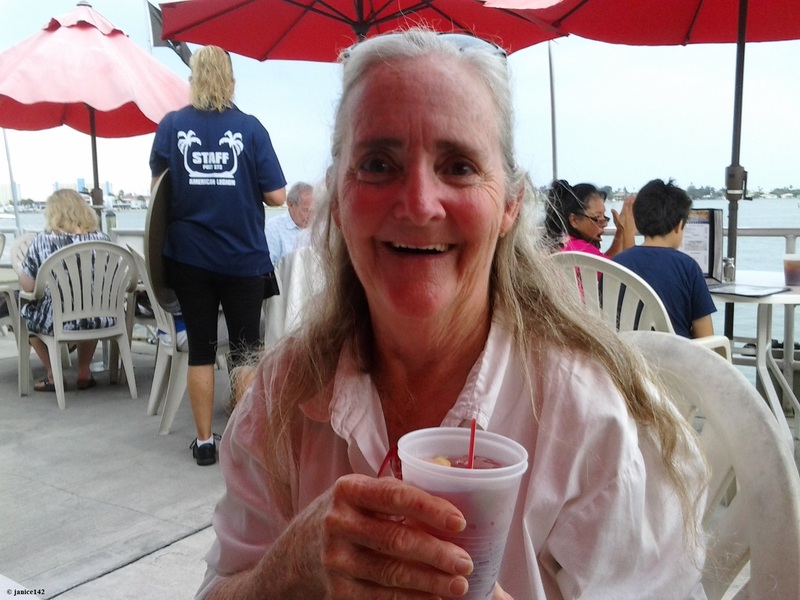 The American Legion in Madeira Beach has boat docks for visiting members in case you wondered. How cool is that?!? Have you ever done large quantities of canning at one time? A favorite aphorism: Never take a 16-year-old male grocery shopping before you feed him.